What a wonderful wine dinner we had on Sunday evening at Zummer!!! HOFWs chose 6 wines and gave the list to the chef. Man did chef do a good job! 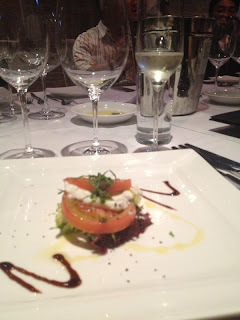 He really understood each wine and found a really nice dish to highlight the wine. Well done chef, well done! 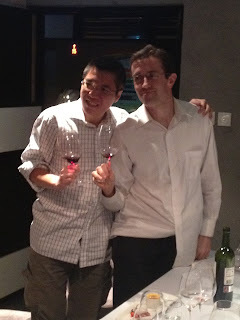 I led each course with a brief description of the wine, region, and how it went with the food. Hopefully someone learned a little something!! So here's the break down. Tomato Mozz Pesto salad. This would definitely be on my table for my last meal. There is nothing, NOTHING, better than fresh mozz and pesto....with bubbles!! 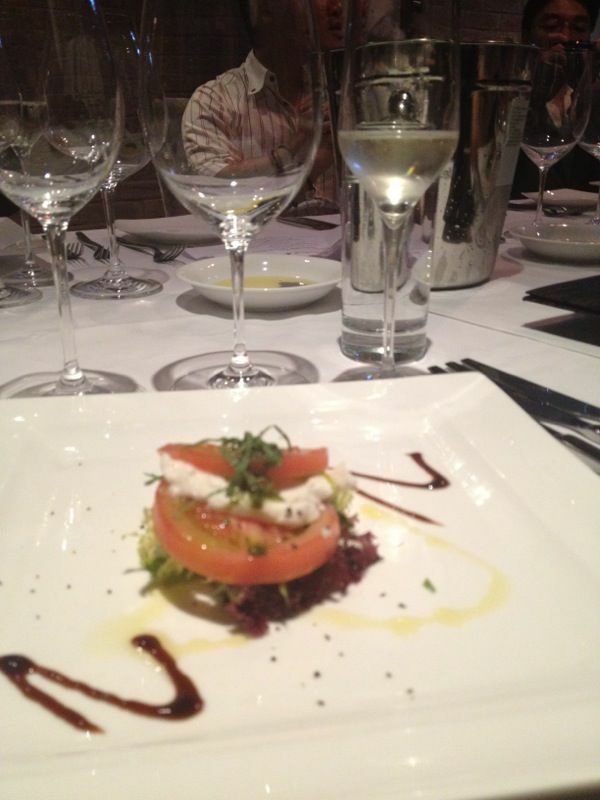 We paired it with our Uvagio Storico Prosecco and it had the perfect lightness to match this delicious salad. 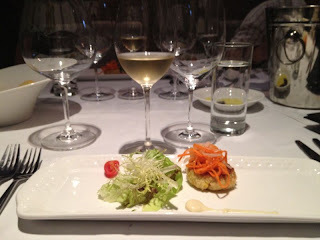 Next we have a crab cake with small salad. 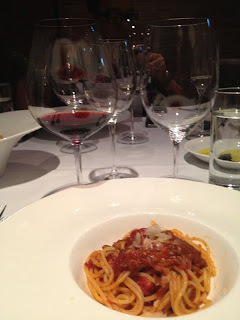 This truly blew me away at how much wine and food are designed for each other. I like this Chateau des Tourtes by itself. But man, with this crabcake it totally sparkled. Not literally. The CdT is a blend of Sauvignon and Semillon and the mix of the acid from Sauv and body from Sem really brought out the creaminess of the cake. Again, well done chef! 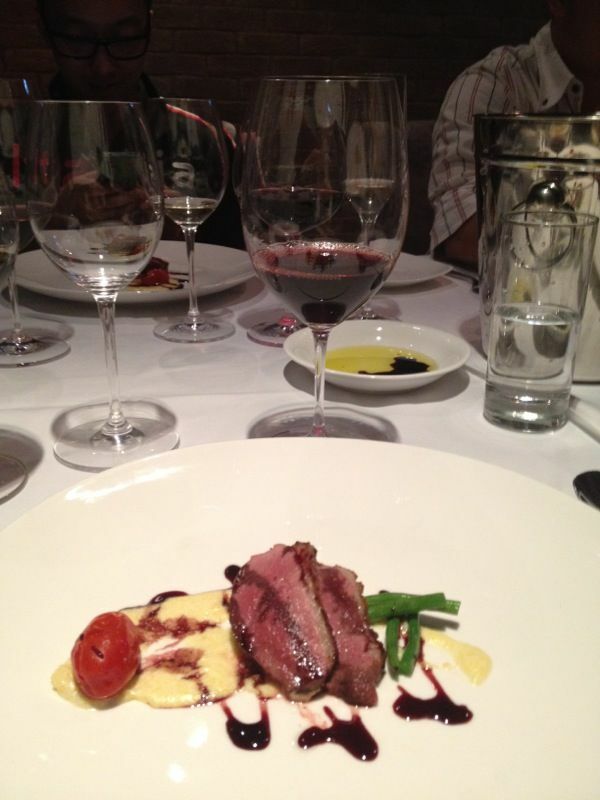 Duck with a port wine reduction and polenta. As you may have guessed from the title of this blog, this was my favorite. The duck was ok (again not a big meat person) but OHHHHH the polenta and port wine!!! I could have licked my plate. And perhaps I did....And the Chateau Haut Veyrac 2003 Saint Emilion Grand Cru was meant for this duck. French wine is made for French food. Together they sing. US Sirlon steak. I suppose for steak it was good. Nice and rare. Juicy. Nice little carrots and potatoes. But steak just doesn't really do it for me. 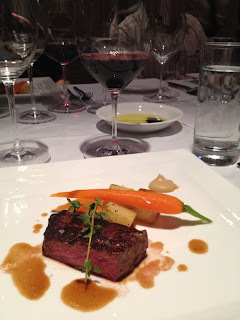 The BIG BAD Dominio de Ugarte 2007 Reserva from Rioja really stood up to this meat. 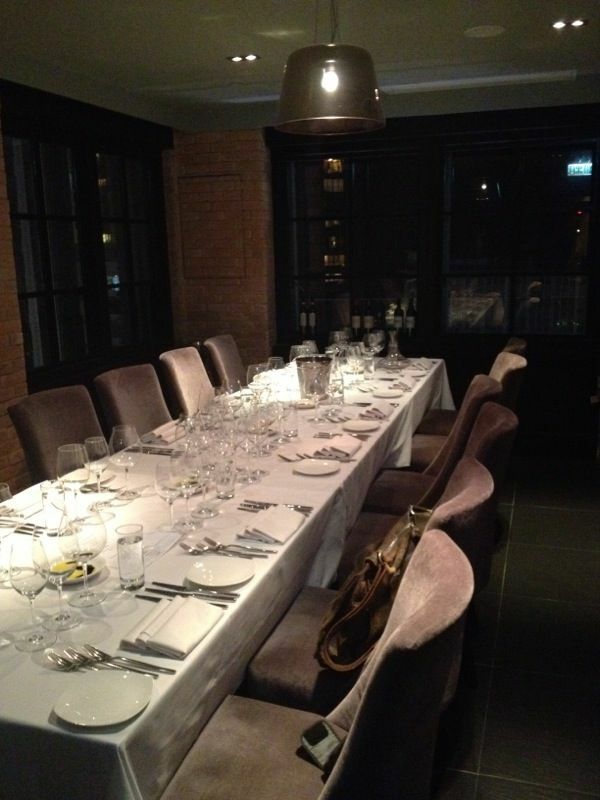 If you hadn't noticed, the course and the wines all got bigger and bigger and bigger. This wine is totally special; spicy, big red fruit, and lonnnng finish. The perfect ending to the reds. And finally. Do do dooooo. 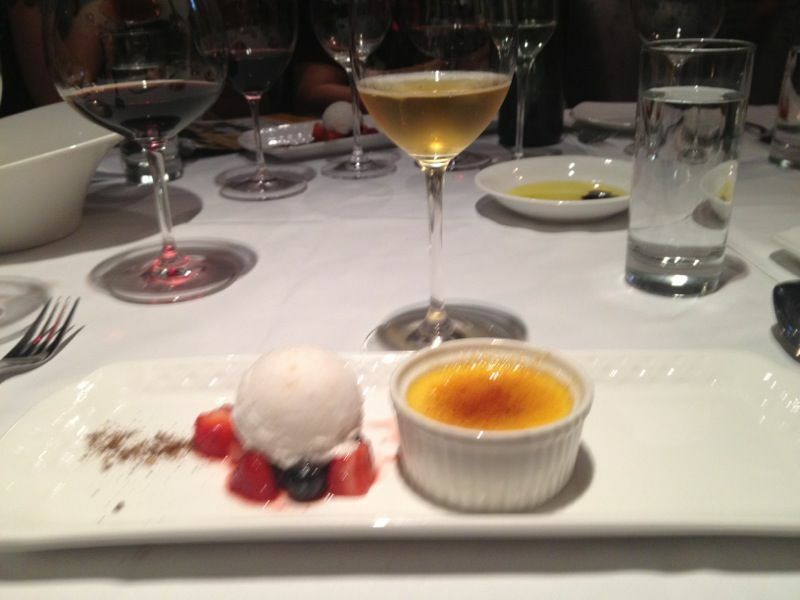 Creme brule with vanilla ice cream and berries, paired with Moscato. This may have been the only course that didn't totally work together with the wine. I think the Moscato was perhaps just a bit too sweet with the already sweet ice cream and creme brule. With that said, it was alll delicious and all consumed nonetheless!